However, a major concern that many people have is weatherproofing for glass doors that lead outside. Don’t the recessed tracks mean that water can enter and cause damage? When you choose Cover Glass sliding doors, you have two options for your sliding glass drainage system: weep holes or drainpipes. Either will enable you to completely avoid any risk of water damage. In this project in Corona Del Mar, we used drainpipes. Let's take a closer look and see how we completed installation. 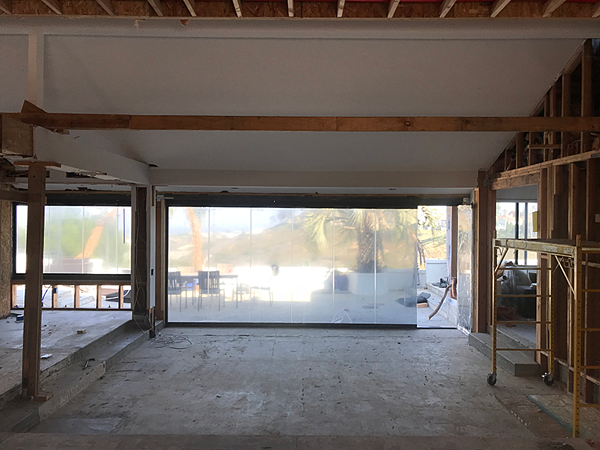 The first step was to install the rest of the sliding glass door system — the glass panels, tracks, and jambs. You can see that the project used grey glass and grey tracks with black side jambs. Once the tracks were set and glass panels in place, we were able to start working on the sliding glass drainage system. Before beginning the installation of any drainage system, we needed to assess the area. 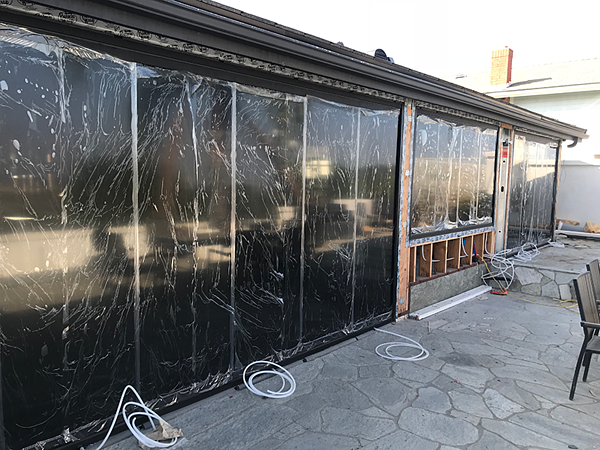 This allowed us to decide on the ideal size and angle of piping and the number of pipes the sliding glass doors would require for optimal drainage. We always attach the piping to the lower track. We use either ½-inch or ¾-inch piping. The piping can come out the front, the underside, or 90 degrees from the lower track — the direction depends on where the homeowner wants the sliding glass drainage system to go. Usually, we install one pipe for every panel. However, we adopt this according to the water exposure the system will receive. The next step was to run the drainage pipes to the desired location. As our pipes are both flexible and durable, they can run in almost any direction. This meant that there was no need to plan the placement of the glass doors with drainage in mind. 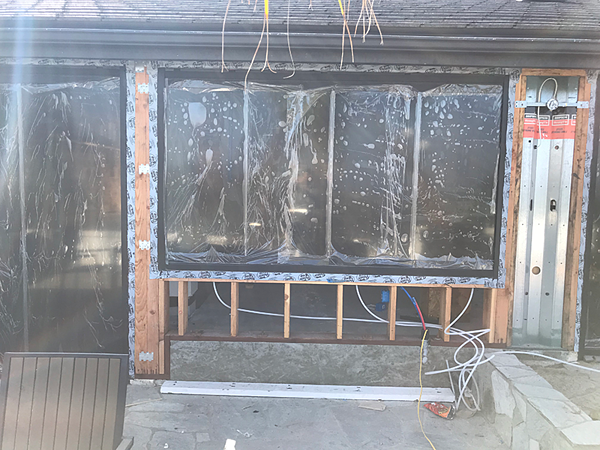 Rather, the homeowners decided where they wanted to install sliding glass doors and then we worked out where the drainage would need to go. 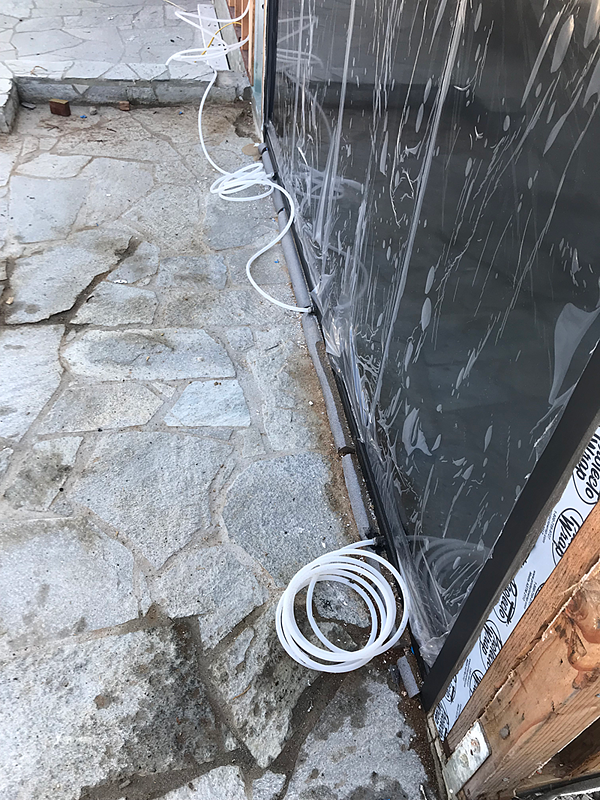 With the drainage system complete, you can see that the use of pipes allows the top and bottom tracks to be completely flush with the exterior floor. This has several advantages. First, it improves aesthetics. Second, it is more comfortable and convenient for the homeowners and their visitors — there is nothing to step over when moving from indoors to outside. Most importantly of all, though, is that it keeps the sliding doors watertight. Any water that hits the glass runs straight down, and if any moisture enters the lower track, it can escape. A major benefit your receive with Cover Glass is that our in-house crews manage all the installation our sliding glass drainage system. It is fitted at the same time as the glass doors and included in the price. In addition, you have the choice of drainpipes or weep holes — we’ll advise you on what is the better fit for your project. Want to learn more information about how much a project like these costs?